Look, I am literally running out the door the catch a plane to Singapore for a weekend off…YAY…and what do I find myself thinking about?? (Apart from all the food I am going to be indulging in once in Singers!!) Posting a recipe for you guys over the weekend…now if I don’t come back to a million comments from you all, or a million likes on Facebook, or follows on Instagram Pinterest, or Twitter, then that is IT…sayonara…off to retirement. I have no team (FYI the lady who left that hilarious comment on the app reviews about my ‘team'!!) My ‘team' is me, my non dish washing kids who will eat my food under duress, my business partner Mandy Moo and of course my supportive dish washing friends who will do anything for some Crio Bru! (Just kidding Deb!) So the least you can do is connect with me in some networking sort of way right? Come on…it’s easy, and well…kinda fun. Promise to keep putting up amazing recipes like this one…oh, and tonka beans are available at Weigh N Pay…This cake is to D.I.E. for…enjoy, and don’t say I never give you anything! Oh, and this also now appears in my Whats for Dessert? ebook…have you got your copy yet? Preheat oven to 170ºC and line the base of a 23cm spring form cake tin and set aside. To make chocolate batter place sugar into Thermomix bowl and mill 10 sec/speed 10. Add butter and vanilla and chop 6 sec/speed 6. Add cocoa, eggs and yoghurt and blend 6 sec/speed 6. Scrape down sides of bowl. Add flour and baking soda and powder. Just combine 12 sec/Interval. Turn into prepared tin and place tin into fridge. To make pistachio batter, place pistachios, tonka bean and sugar into Thermomix bowl and blend 20 sec/speed 8. Scrape down sides of bowl and repeat, adding the almond oil through hole in lid to create a paste. Add eggs, butter and cream and blend 6 sec/speed 6. Scrape down sides of bowl and repeat. Add remaining dry ingredients and just combine 12 sec/Interval. Place handful chocolate chips on top of chocolate batter. Pour pistachio batter on top carefully spreading so as not to dislodge the chocolate batter. Bake 60 minutes or until inserted skewer comes out clean. Cool on wire rack before removing from tin. To make ganache, place chocolate and tonka bean into Thermomix bowl and mill 10 sec/speed 10. Add remaining ingredients and cook 5 min/60ºC/speed 2. Cool slightly before pouring over cold cake. 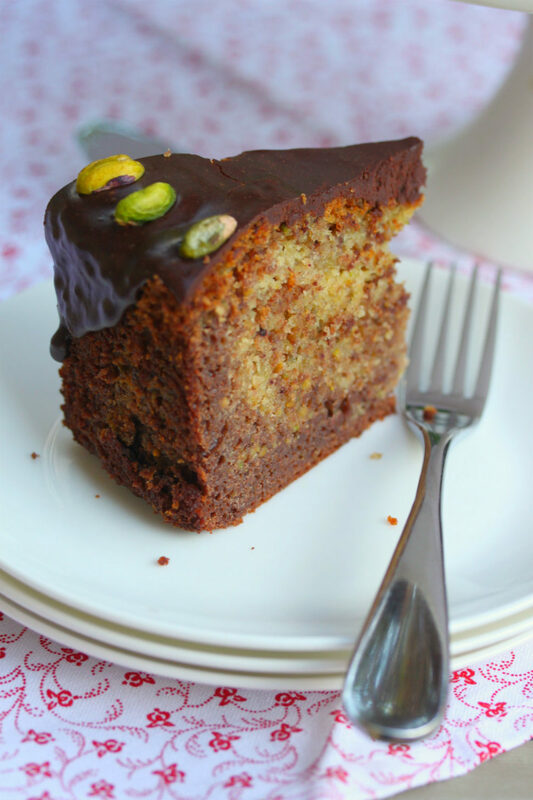 Garnish with additional choc chips, pistachios as desired.